In close-to-nature silviculture one strives to derive the advantages of the natural adaptations of tree species to different growth conditions. Evidence of the natural distribution of tree species is obtained through vegetation science (recent ground vegetation, primeval forest relicts), studies of old written sources, and pollen and macrofossil analyses. Here we have analysed macrofossil samples of charcoal kiln sites and the recent ecological conditions in the vicinity of these sites, as well as secondary written sources on forest and land-use history. 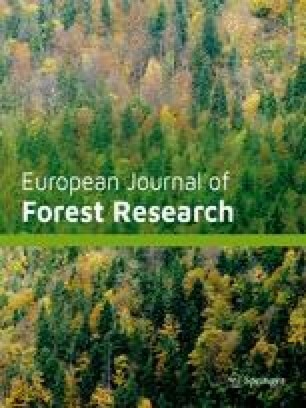 From charcoal analysis of kiln sites we were looking for spatial patterns of past tree species exploitation, with special regard to regional and local differences in the forest growth conditions and the natural wood supply. Therefore, we selected remote forest areas characterised by a high density of kiln sites and significant differences in the ecological conditions. The sample sites ranged over a landscape profile of 40 km, covering many ecological site types. The anthracological results of 181 post-medieval kiln sites were evaluated, considering two spatial scales: the total 40-km profile and a fine-scale profile of 4 km. Considering the charcoal material analysed as a whole, all of the tree taxa to be expected based on the natural conditions were found. The frequencies of the exploited taxa also reflected a natural situation. Wood of the climax vegetation, Fagus, Abies and Picea, was mainly used and all other taxa were quantitatively unimportant. The results for the individual sites showed considerable differences in taxa composition, from which regular spatial patterns of the past tree species distribution were deduced. These regional and local patterns are explained by natural differences in the ecological conditions in the vicinity of the sample sites. At the same time, new indications of the natural tree species composition of our forests are inferred. A pronounced dependency of charcoal production on the local natural wood supply is discernible. No indications of tree species selection or forest degradation could be found. This research was supported by the German Federal Research Ministry (BMBF, Bundesministerium für Bildung und Forschung; grant no. 0339768). Most of the anthracological analyses were undertaken by Mrs. Marion Röder. Dr. Edgar Kublin (Forest Research Institute of Baden-Wuerttemberg) and Dr. Manfred Neumann (University of Freiburg) gave valuable support in questions of statistics. We are grateful to the reviewers and the editor for providing many helpful comments on the manuscript.